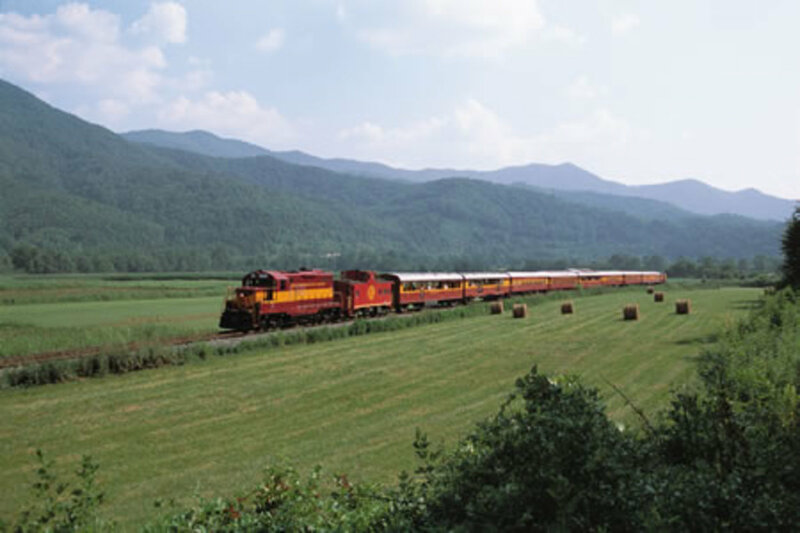 BRYSON CITY, NC – PEANUTS™ The Great Pumpkin Patch Express returns to the Great Smoky Mountains Railroad for 2009. As the leaves are turning in October and pumpkins are ready to be carved, Charlie Brown, Lucy, and Snoopy return to the GSMR Pumpkin Patch October 2, 2009. The excursions, which are themed after Charles M. Schulz’s classic story “It’s The Great Pumpkin, Charlie Brown,” will be departing from the Bryson City Depot October 2, 3, 4, 9, 10, 11, 16, 17, 18, 23, 24, 25. Friday departures will be at 3:00pm. Saturday and Sunday departures will be at 11:30am and 3:00pm. Guests will hear a narration of Schulz’s “It’s The Great Pumpkin, Charlie Brown” as the train travels to the Pumpkin Patch. Upon arrival, passengers will be greeted and have a photo opportunity with Charlie Brown, Lucy, and Snoopy. Activities to enjoy at The Great Pumpkin Patch will include: campfire marshmallows, a coloring station, temporary tattoos, trick or treating, and a bouncy train. The children can also navigate through a giant hay bale maze. Other activities include hay rides, bobbing for apples, apple cider or apple juice, and treats. There will be plenty of PEANUTS™ merchandise at the Smoky Mountain Trains gift shop! Each child will also select their own small pumpkin from The Great Pumpkin Patch to take home. For more information and reservations please call 800-872-4681. PISGAH FOREST, NC – Come learn about the 1915 Climax logging train on display at the Cradle of Forestry, and how it wound its way through the forest coves of western North Carolina for over 40 years during the Nation’s pioneering era of forestry and timber harvesting. Enjoy a slide program at 10:30am and again at 2:00pm presented by Western North Carolina train historian Jerry Ledford. After each program walk the Forest Festival Trail to see the Cradle’s historic Climax locomotive. Climb on board, ring the bell and hear the sound of a steam whistle. This event takes place on Saturday, June 25 from 9am-4pm. The Asheville chapter of the National Railway Historical Society members will display a hands-on railroad yard and HO scale switching layout. Learn how to move railroad cars within the yard, how to switch tracks and set up an entire train from engine to caboose. Enjoy seeing pictures from Southern Railway in the 1950’s, old railroad lanterns and other memorabilia.